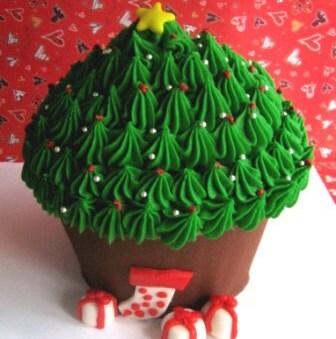 This giant cupcake is decorated like a festive Christmas Tree, complete with a Christmas star atop the tree and presents underneath. Cake measures approximately 18 cm by 18 cm (6-inch diameter) and depending on appetite, serves between 12-20 people. The giant cupcake is vanilla cake and is frosted with chocolate and vanilla buttercream frosting and accented with hand-made fondant decorations. Please place your order at least 24 hours in advance.